Remember how you thought your baseball cards were going to make you rich someday? Well, that surely didn’t happened. Unless you are old. Really, really old. Because while today’s mass produced and well-taken care of baseball cards are never going to be worth much, the cards that the youngsters collected a hundred or so years ago are worth many, many pretty pennies. Below is our list of the ten most valuable cards of all-time. Pity the fool who put one of them in his bicycle spokes. Eddie Plank was a pretty good little left handed pitcher, racking up 326 wins for the Philadelphia Athletics and St. Louis Terriers over his early 20th century career. His baseball card from the legendary American Tobacco Company T206 series is also among the most valuable ever printed. In fact, Plank’s T206 card has always been worth a lot. In the 1930s when The American Card Catalog came out with its maiden edition Plank’s was the second most valuable card on the market — going for a then princely sum of ten dollars. Well times have changed and there has been a lot of inflation. In 2009, a Plank T206 in “good” condition sold at an auction for $155,350. It is estimated that a mint condition Plank — if there is one out there — would fetch around $200,000. Most baseball fans know the story of Shoeless Joe Jackson. A simple country boy and Major League Baseball hitting machine, he was thrown out of baseball after admitting to conspiring with gamblers to throw the 1919 World Series. Since Jackson had hit .375 and slugged a home run during the Fall Classic many doubt he was fully aware of what was going on. 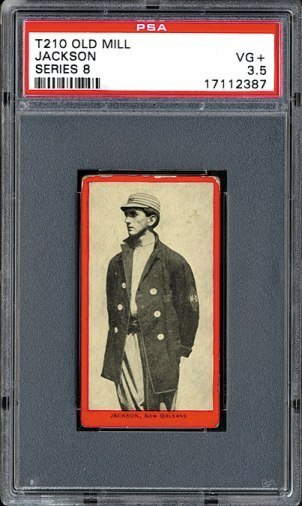 The mystique of Shoeless Joe has contributed to his baseball cards being worth a lot of money. A 1910 Old Mill Tobacco Card with Jackson as minor leaguer with New Orleans was recently auctioned for $ 50,000 despite only having a PSA rating of 3.5 out 10. This suggests a mint condition Jackson T210 would go for over $200,000 on the open market. The extremely rare 12 card 1914 Boston Garter series was both a traditional baseball card and an advertisement for Boston Garter’s sock garters — which were a big deal back in 1914 since socks didn’t have the elasticity that we now take for granted. As such, the cards were only given to certain distributors who requested them on official stationery. The favorite and most valuable card of the set features on the front a vividly colorful painting of Shoeless Joe Jackson swinging a bat above a giant sock garter. And on the back there are Jackson’s statistics and sock garter pricing. At a recent auction a Jackson 1914 Boston Garter that was rated excellent was sold for $204,000. A mint condition version would be worth even more, but given the scarcity of the set there is a good chance that none exist. As an anti-tobacco activist, Honus Wagner didn’t want his image to sell tobacco products. (More on that later.) But he had no problem appearing on baseball cards that promoted candy and tooth decay. But even with Wagner’s approval, the Hall of Fame shortstop’s baseball card in the 1910 Standard Caramel set, which features a painting of Wagner throwing a baseball, is still extremely rare. Only three are known to exist with a PSA rating of more than six out of ten. In 2010, a Wagner with a PSA of 8 went for $ 31,000. But if somebody were to unearth a mint condition version it has been estimated that it would fetch about $215,000. That’s a lot of candy. And a lot of tooth decay. Back in the early 20th century it seemed that everybody was getting into the baseball card printing game. We’ve already seen examples of cards used to sell tobacco, candy and sock garters. So why not bread? Between 1911 and 1914 a bakery in Buffalo, New York issued a 25 card set of baseballs stars, including former Major League hit king and all-around terrible person Ty Cobb. The card featured Cobb holding a bat and flashing the kind of scowl we’ve come to expect from the baseball’s black-hatted legend. In 2010, a Brunner’s Bread 1911-1914 Cobb with a PSA of eight out of ten went for $ 94,000 at an auction. If there were to be a Cobb with sharper corners and less fading it would likely be worth around $ 250,000. So maybe that dusty old box in your grandfather’s attic is worth another look after all. Lou Gehrig was one of the greatest hitters in Major League history. He is also one of the most tragic tales, as the disease which now bears his name prematurely ended his career and his life. Not so long ago some lucky enough collector was able to find a 1933 Goudey’s Gehrig in perfect, gem mint PSA 10 out of 10 condition. Their reward? The rare immaculate card fetched $234,000 at a 2007 auction. It’s likely worth even more than that now. Mickey Mantle’s 1952 Topps card isn’t technically his rookie card. That would be the 1951 Bowman Mantle which is worth around $100,000. 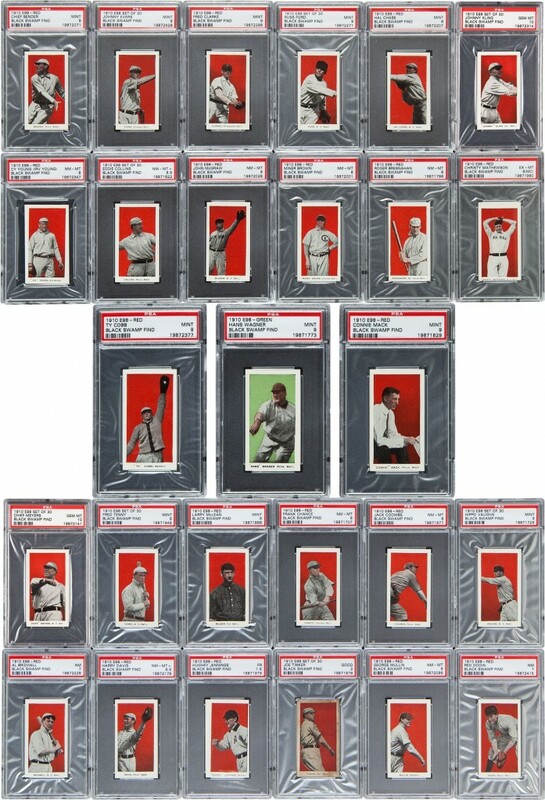 But there is something about the 1952 Mickey Mantle 1952 Topps card (#311) that has always resonated with collectors. Maybe it’s the photo of The Mick, looking so young and fresh before all the wear and tear he incurred on the field and off. Maybe it’s because the Yankees have such a large fan base and thus many collectors grew up with Mantle as their favorite player. But whatever the reason Mickey Mantle 1952 Topps is the most popular card ever. We know this because it’s worth absurd amounts of money even though it was mass produced and even double printed! Jim Doyle wasn’t much of a Major League pitcher. His lifetime record of 22-21 for the New York Highlanders and Cincinnati Reds is better than, say, you could probably do. But it’s not the kind of career mark that gets remembered 100 years later. No there is something else that makes the Doyle card in the famous T206 set so valuable: A printing error. 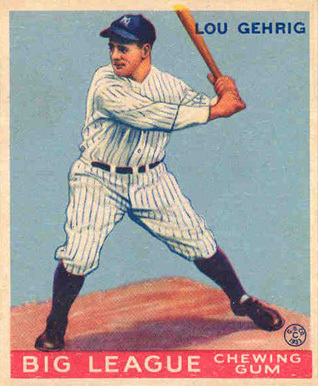 During the set’s first few printings, Doyle was listed as “N.Y Nat’l”, meaning he played for New York in the National League. But the Highlanders were in the American League and the printers dealt with the error by simply scrubbing off the “Nat’l” part in all the rest of the printings. In fact, it wasn’t until the ‘80s that anybody even realized the erroneous National League Doyle card existed. This card is so rare that recently a Doyle which rated just three out of ten on the PSA scale fetched 350,00 at an auction. So basically the sky’s the limit if there were ever to be found a gem mint version of the error card. Before Babe Ruth was a star pitcher for the Red Sox and way before he was a hitter of unprecedented ability for the Yankees he played for the Baltimore Orioles, who were then a minor league team. The first baseball card ever produced of Ruth is from this time period and features a photo of surprisingly svelte Bambino, who had just signed with the club out of the St. Mary’s School For Boys in Baltimore. 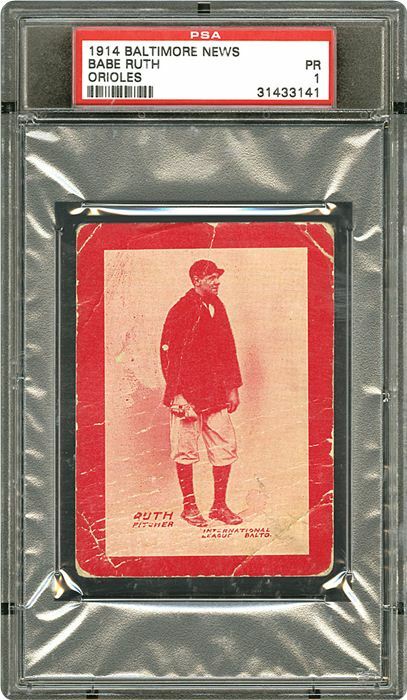 Only ten of these Ruth “rookie” cards are known to exist and if you have one you might want to think about an early retirement. At a 2013 auction a 1914 Babe Ruth Baltimore News with a PSA of 1 out of 10 — meaning it’s barely holding itself together — went for a whopping $450,300. A 1914 Ruth that was just a PSA of five could possibly reorder this list. But so far one hasn’t stepped forward. Honus Wagner was quite a ballplayer. The Flying Dutchman was the greatest shortstop to ever live and one of the original five Hall of Famers. But, these days, what Wagner is most famous for having his face on the most valuable baseball card in the history of the collectable. Because of his objection, ACT stopped printed the card after just between 60 and 200 reached market. The card first made waves in 1991 when Wayne Gretzky and Bruce McNally bought it for $451,000. It been sold a few times since, most recently for $2.8 million. 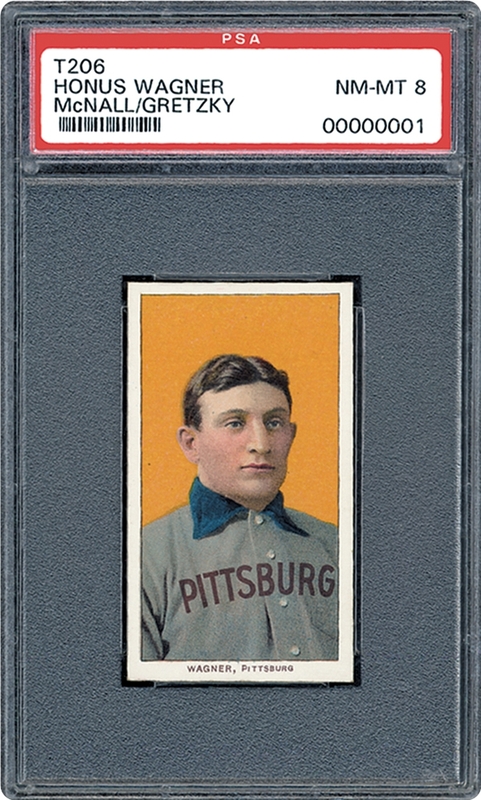 There are other Honus Wagner TSA 206’s besides “Getzky’s” floating about. But they tend to be regarded as either forgeries or low grade cards which have been altered to look near mint. Caveat emptor..